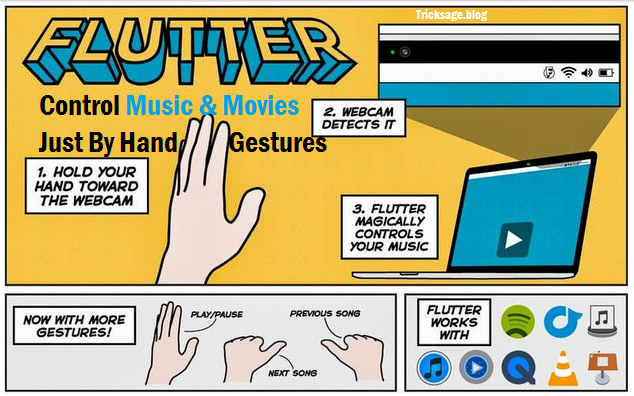 Many of us are techsavy and we always want to be ahead of others(friends)with latest technology and today I will tell you about an awesome gesture interface Technology by which you can control your music and movies just by using hand gestures and even from a distance, this technology is nothing but just a simple PC app called as “FLUTTER” which uses buit in webcam to detect your gesture and play, pause , stop and do other functions while you are listening or watehing movies. Isn’t it an awesome technic and now you are thinking that it will need a high end PC, laptop then definitely flush your thought because it a small size(3.5 mb) program and work fine with all PC,laptop And quit easy to install and use. Flutter app is available for Windows and Mac and it even allow you to control you online website easily like YouTube, Netflix and many other by just installing the Flutter Chrome App, so it pretty fun to be used, so lets see how its done. Download Flutter App for Windows or Mac. Now it's a small file just 3.5 MB so download and install it on your computer. After installing it will start on the GO, so you will see the F icon in your status bar. Now the colorful F icon states that the app is working, now that will also display the light on your webcam, now one left click on that icon will turn it into black and white that means its disabled and not working. So now you can follow the tutorial that will guide you through all the hand gestures that you can use to control your music and movies controls. So now if you want to control all your online websites using Flutter app then you can install Flutter Extension and get everything going on.